Gran Turismo is a racing game franchise known by many, with its sheer quality of quantity being its key selling point. Special Stage Route 5 (SSR5) is one of the titans of the series, having been in every main game along with Grand Valley, Deep Forest and Trial Mountain, before GT Sport came along and erased a lot of what was good about the series. I was always a fan of SSR5, with it's incredibly long start/finish straight, and the chicane which was absolute wack compared to how much tamer the Clubman layout is. The track is mostly accurate, the elevation changes are as close to the original as possible, but the building placement is noticeably different, along with the textures for them. Making a city track like this is rather difficult because of the fact that you'll see a lot of what's out-of-bound a lot easier with RV's camera, compared to the one in GT. But I am pleased with the end result, with the atmosphere and the look being instantly recognizable. I spent countless hours driving around SSR5 in GT1 to make the recreation as close to the original as possible, and fill the gaps wherever they were required. A lot of textures are printscreens from the original game as well. 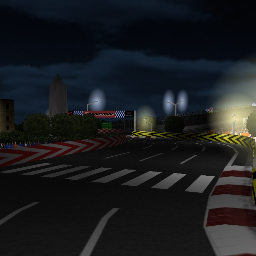 On top of custom properties utilized in the pit lane, the track utilizes more than 10 texture files. SO MAKE SURE TO USE THE LATEST RVGL PATCH, OR THE START GRID WON'T SHOW PROPERLY.